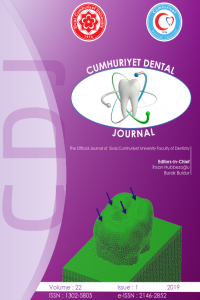 CDJ is an international journal dedicated to the latest advancement of dentistry. The aim of this journal is to provide a platform for scientists and academicians all over the world to promote, share, and discuss various new issues and developments in different areas of dentistry. First issue of the Journal of Cumhuriyet University Faculty of Dentistry was published in 1998. In 2010, journal's name was changed as Cumhuriyet Dental Journal. Journal’s publication language is English. Evaluation of Caffeic Acid Phenethyl Ester Administration in Chronically Stressed Rats with Experimental Periodontitis.